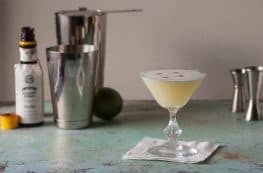 The Martinez is an old drink, a predecessor to the familiar Martini, made with Old Tom gin, a style of gin popular in the 19th century that predates the London dry style of gin that we find most commonly now. Old Tom gin has been experiencing a revival with many differing interpretations. It was, for many years the most common sort of gin. The British style Old Tom was clear and light, while the American style, having made its way across the ocean in barrels on ships, took on a darker hue and also took on some of that barrel-aged flavor. I’m partial to Ransom Old Tom, which is sweeter and fuller bodied than London dry varieties and it’s brown in color because it’s aged in wine barrels. I think of it as a bridge between gin and whiskey. I think of the Martinez as something more akin to a Manhattan than a Martini. Its base spirit is the Old Tom gin, which gets rounded out with sweet vermouth and a splash of maraschino liqueur, which is a clear dry liqueur made from tart cherries (that has nothing in common with the sweet neon cherries that top ice cream sundaes) and a few dashes of Angostura and orange bitters, which bring a hint of warm spices and fruitiness to the drink. 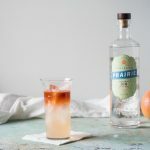 It all gets stirred with a barspoon, strained into a chilled coupe or old style martini glass, and garnished with a twist of lemon peel expressed over the drink. It is a drink I find remarkably equanimous. It’s not too sweet, not too tart, not too bitter, not too light, not too dark. It’s perfectly in balance. The Martinez is one of the default cocktails in our house. It’s a drink that Dan and I are never not in the mood for. This cocktail is a regular one around these parts. It is a spirit-forward drink that’s perfectly balanced. Old Tom gin is making a comeback for a good reason. It’s sweeter and more full-bodied than the popular London dry style gins like Beefeater. This isn’t a place for Plymouth or Bombay Sapphire. I recommend Ransom Old Tom gin, an Oregon gin that is aged in pinot noir barrels, but I’ve had the drink made with Hayman’s Old Tom gin and enjoyed it that way as well. 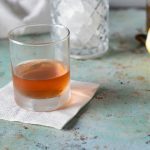 (Michigan’s Journeyman Distillery’s Bilberry Black Hearts Barrel Aged gin is not technically an Old Tom style, but the barrel-aging makes it work well in a drink like this.) 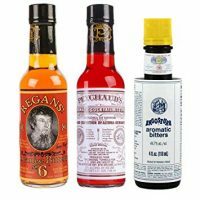 Use any sweet vermouth you like. 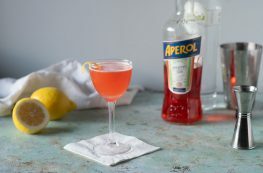 A big-flavored vermouth like Carpano Antica or Vya is especially lovely in this drink. 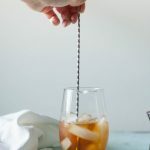 Add the Old Tom gin, sweet vermouth, maraschino and both kinds of bitters to an ice-filled mixing glass (or mixing tin) and stir with a barspoon until chilled. Strain into a chilled coupe or martini glass. Garnish with lemon twist. Serve immediately.